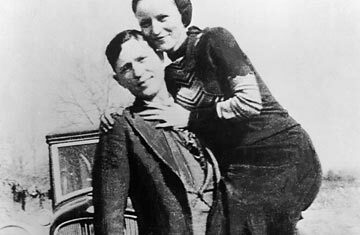 Bonnie and Clyde, the good-looking outlaws very much in love, were ambushed by police officers outside Gibsland, Louisiana 75 years ago, on May 23, 1934. Trapped in their car, they went down in a hail of bullets and their 21-month-long crime spree of robbing gas stations, restaurants and local banks came to an end. Bonnie Parker and Clyde Barrow kept their heists small but brutal  they had a tendency to kill anyone who got in their way. In January 1934 they orchestrated a prison escape in Texas that resulted in the deaths of two guards. Three months later, they murdered two police officers and a constable and kidnapped a police chief. The Texas Highway Patrol announced an official manhunt, and it was only a matter of time before the bandits were caught. The couple never married, and Parker had no previous record before she met Barrow, an ex-con. Historians believe that she chose the life of crime because she was in love, and the handful of photographs of the two of them  she in his arms, he holding her up  seem to indicate that this was true. Their story seemed like something out of a movie and later, it was.